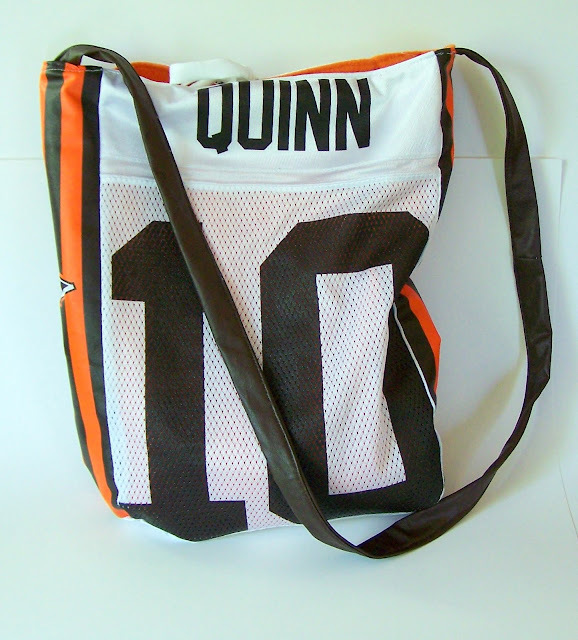 We were thrilled to learn that he was drafted by the Cleveland Browns and quickly acquired lots of Brady gear. Well, after disappointment in Cleveland (who never game him a chance in our opinion) he is off to Denver where we hope he has success. Meanwhile, Annie has a new bag! She worked on this bag, secluded in her studio, for days. She wanted to surprise me – she didn’t ask for any help until I heard frustration in her voice. She was using her original jersey and materials she found around the house. She wanted to have a vinyl strap, but was struggling sewing it. That’s when I stepped in to help. But I was amazed at how well she constructed the bag. 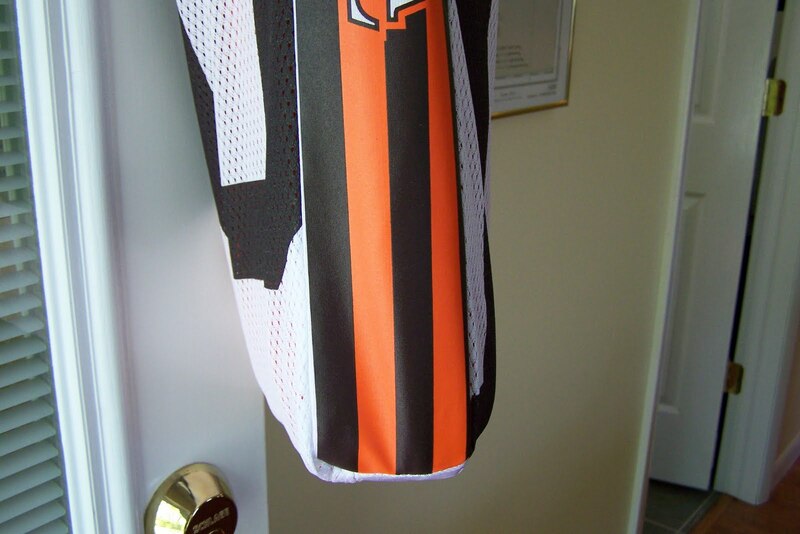 She lined it with orange polar fleece, added a tie closure and used the striped portion of the jersey to make the sides. Brilliant! She did a great job! wow! love it, off to look at my son’s soccer shirts!! That is one heck of a great looking bag! How long has she been sewing? What a cool idea! 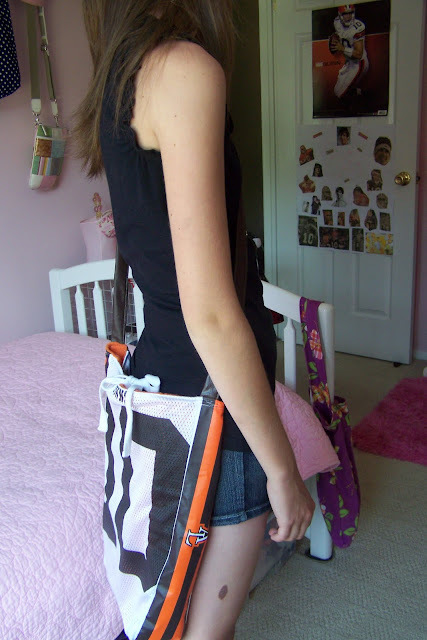 I wish I had a teenage girl to sew for… there are so many fun things you can make for them! Cute bag! Annie is very talented. Seriously clever! That Annie is such a talented young lady! You can tell that she loves brady quinn with the posters in the background! Annie did a great job! I’m super impressed. Really cute bag, too! 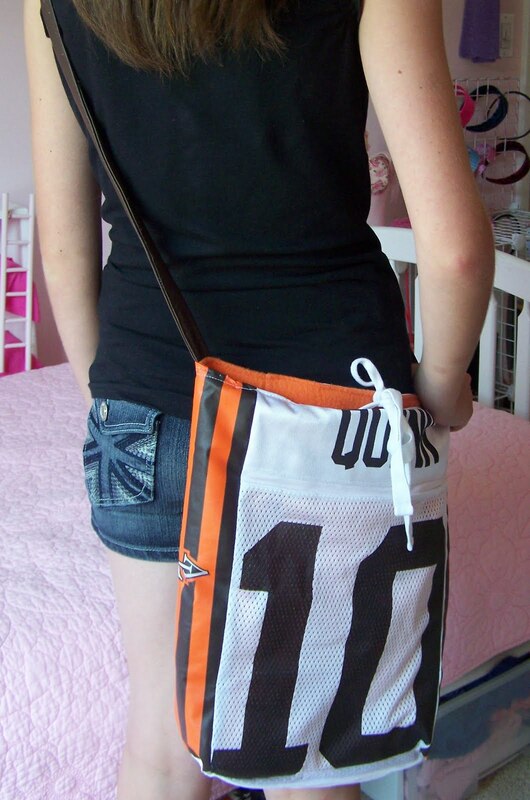 I will have to do this with my old soccer jersey. Off to check out her Etsy site!